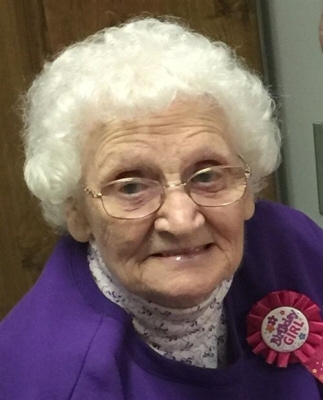 Jackie Avanell Wood, 103 of Lewisburg, Kentucky died on Thursday, January 24, 2019, at Hearthstone Place in Elkton, Kentucky. She was born October 12, 1915, the daughter of the late Clarence William and Nell Smith Helsley. She was a member of the Eastern Star and Mt. Pleasant Baptist Church. She was preceded in death by her husband, Harold S. Wood, Sr. and son Harold S. Wood, Jr.
A Funeral service will be at 10:00 AM on Monday at Price Funeral Home, Inc. located at 252 E. Green St. Lewisburg, Kentucky 42256 with Bro. Ronnie Forrest officiating. Interment will be in Rose Hill Cemetery, Central City, KY.
A public visitation will be held from 5:00 PM to 7:00 PM on Sunday, January 27, 2019, at Price Funeral Home, Inc., 252 E. Green St., Lewisburg, Kentucky. To plant a tree in memory of Jackie Avanell Wood, please visit our Tribute Store. 603 E. Everly Brothers Blvd. "Email Address" would like to share the life celebration of Jackie Avanell Wood. Click on the "link" to go to share a favorite memory or leave a condolence message for the family.